I was 8 years old. I remember it specifically. I lived with my parents in the university campus in a house that was spacious and had rooms enough that many a times we rented out a room or two to university boys. This is how he, the abuser, got the entry to my house. He was 20-22 years old and had rented a room in our house on the terrace and was a student at the university where my father was a professor. He was our distant relative and this made him a regular visitor to our house. I used to call him ‘mama’ – maternal uncle. First time when he caught hold of me was when I was playing hide and seek with my 7 year old brother on the terrace. Innocently he asked if he could join us in our game and more innocently we agreed. After all, in a game of hide and seek, the more the better! He was playing with us now and then asked my brother to give him two minutes so that he could find a place to hide along with me. My brother went to the other corner of the terrace and this jerk took me inside the bathroom on the terrace and locked it from inside. I assumed he did so to hide both of us. I didn’t understand at all what he meant by it but I thought maybe it was a part of our game. He laid on top of me and started kissing and licking me all over my face and lips. I felt weird but this all happened so suddenly that I didn’t know what to do. My brother and I came downstairs immediately as it had got dark outside. I didn’t mention the incident to anyone. Not even to my parents. But I kept feeling disgusted about it. I thought of confiding in my mom but I didn’t because I was scared and I thought my parents wouldn’t let me play after knowing of this incident. Moreover, I thought maybe Mama did it by mistake. Days passed by and I forgot about that incident. I had come to believe that it all happened as a mistake until it happened once again. This time he asked my mom for the day’s newspaper. My mom, since she didn’t know of anything that had happened, asked me to go upstairs to give the newspaper to him. I went upstairs and knocked his door. As soon as he opened it, he dragged me inside and pushed me on his bed. He repeated the same thing again only a little more forcefully and to a step ahead. This time he tried to remove my clothes. I could but under his body, I couldn’t even move. Suddenly, my mom called my name and he left me go. I immediately got down and wanted to tell my mom about what had happened but this time also I couldn’t. As soon as I decided to tell her, mom scolded me for being careless and taking time to deliver a newspaper. The agony inside my heart remained there only. I couldn’t utter a word to mom about it. But this time I had made up my mind – what he did to me wasn’t a mistake by any standard. Mama wasn’t innocent and what I underwent wasn’t pleasant. Since then I maintained a safe distance from him but still he found me one unfortunate day! His father had visited us along with few guests. All were having dinner while my brother and I were busy with school projects. It was 9:30 pm and I suddenly realized that I needed a 12 inch scale urgently. Mom was busy in the kitchen, dad was busy with the guests and it was very dark outside so I knew there wasn’t a way to get the scale from the market. Poor me, I had no option. I went upstairs but decided to not enter his room. He got the scale but noticed that I wasn’t entering his room. Upon seeing my insistence on remaining outside his room, he forcibly pushed me into his room, locked it from inside and threw me on his bed. I blamed myself for being foolish to come upstairs. I was in tears as I knew this time neither my brother would come knocking on my door and nor m mom will realize that I was trapped here. I asked him to stop but he wasn’t any less than a monster. I prayed to God to save me from this torture but nothing seemed to help. Suddenly, I felt his hand under my skirt. As he slid his hand inside my skirt, I looked at him angrily. My eyes were burning with anger. He saw my eyes and tried to kiss me and I SLAPPED HIM. I vividly remember my emotions and my fury and his expressions at that moment. First he was shocked to see my courage and anger but then he dismissed it as an accident. He thought I had slapped him by mistake. So he held me with a more firm grip and that is when I slapped him again. I SLAPPED HIM AGAIN AND HARDER this time. The shameless fellow didn’t stop even then. Not even after being slapped by a 8 year old! I said, ‘look here’ and he looked towards me. I SLAPPED HIM AGAIN for the third time! He was stunned. He hadn’t imagined it from me. I think he had understood it then. He got up. Gave me the scale and let me go. I opened the door, rushed downstairs and went straight to the dining area where everyone was having food. I was panting and my clothes were lose and hanging on my body. The scale was in my hand. Looking at me, my dad asked me, ‘what happened beta?’ Daddy thought I had gone to the market running. 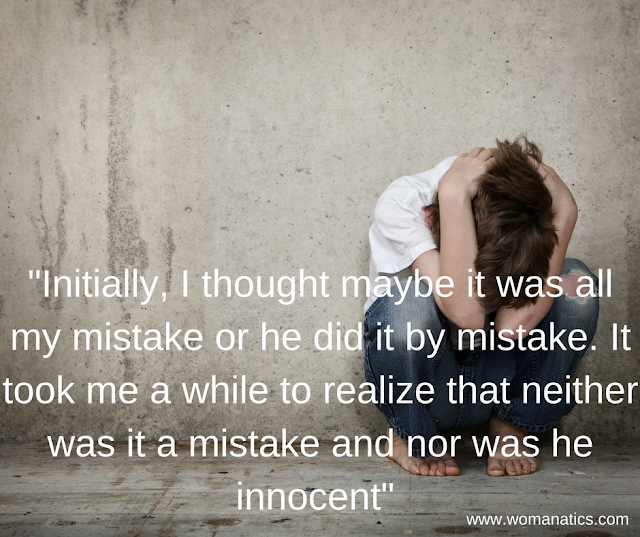 I looked at the abuser’s father and said, ‘Mama did it.’ By that time, my so-called mama had also come downstairs. He looked worried. Mom came out of the kitchen. Dad asked me to go inside. I went straight to my project and drew the necessary lines that I needed the scale for. I could hear some shouting and loud discussion from behind the closed door. After few minutes, my mom came inside to hug me and check me up. I told her that I was fine and I had slapped him. She congratulated me on my courage and by then my work was finished so I threw away the scale. All I now remember is that by the next morning that man was gone, forever! Today, as I am 21 years old, I feel proud of myself of dealing with it on my own. I wish I had done it the first time it had happened to me. But nevertheless, it is never late to do the right thing. I am no more timid or shy. I am determined and confident. Also, now I understand why my name means ‘Goddess Durga.’ That night, with that devil, I was no less than a young Goddess Durga. Note: This story is contributed by a regular reader who chooses to remain anonymous. Please show her your appreciation for the courage and bravery she showed behind the doors at such a tender age. Thank you Reader for sending me your story. It is indeed a story of courage and inspiration. We, the moms, need to learn a lot from it. I have certainly taken many lessons from it. From today, I promise, I won’t question my girl. 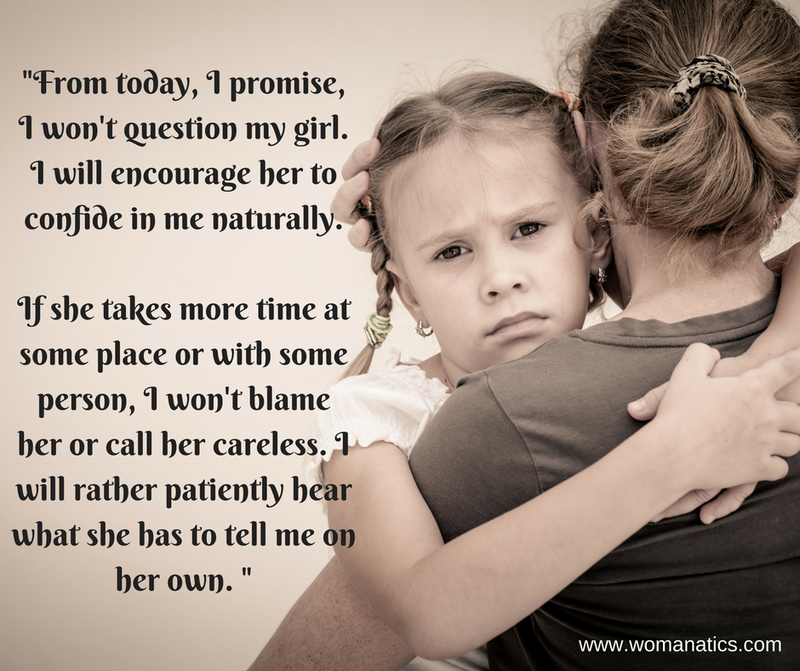 I will encourage her to confide in me naturally. If she takes more time at some place or with some person, I won’t blame her or call her careless. I will rather patiently hear what she has to say on her own. I will learn and hone for myself while teaching the power of intuition to my child. I will not force my young child to be friendly with others. I have come to understand that children have their own intuitive powers as well. My daughter, Pahal, takes her own different times to get close to people. And while I never force her to join a party or dance or mingle with kids, I am NOT GOING TO DO SO even in the future. I will let her open up on her own. And last but not the least, I WILL BELIEVE MY CHILD. As parents, it is our utmost duty to place our trust in our kids. Our kids will trust us only when we trust them first. I remember how last night itself I asked Pahal if she did some XYZ thing and she confidently replied, ‘NO’ and I told her that I trust her. I said, ‘Pahal, Mumma trusts you. I always trust you.’ I think I just need to repeat that more often. Parenting is hard in one way but easy in another. It becomes much easier if we just let it uncover on its own. If we do the basics right – teaching them to trust, asking them to open up, blaming them lesser and lesser and confiding in them more and more – parenting becomes the best joy in life. A real hero! You have been unexceptionally brave for an eight year old. I don’t think I would have been able to do such a thing! Slapping 3 times in a row!! Bravo! I am totally inspired. It’s not just about the abuse, its also about the parent’s attitude and action towards child abuse. A Great lesson!! Yeah, she really is brave. I wish all the young girls take a lesson from her. She will be glad to read your comment. You are brave!!!!!! I admire your strength!!!!!! You were so brave! My brother also abused me when I was 4 I remember being so scared and wanting him to stop but he just kept on, he forced me to touch him and he touched me. I didn’t do anything. I wish I could’ve asked him to stop, I know he would’ve I still visit him once a week. He is my favourite brother and he dotes on me because he knows how much he hurt me. I still wish I could’ve at least tried to stop him.